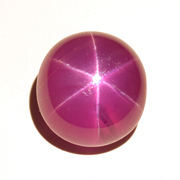 Pinkish red star ruby. Very sharp, well-defined star with good translucency. Measurements:	10.22 x 9.57 x 6.95 mm.